Does this plugin sit on top of jqueryui dialog? I'm on my phone so I haven't opened the plugin and looked yet. Just wondering because I just used that for the first time the other day and now I am curious. No I am not using jQuery UI at all for this modal. But you could if you wanted to. Just replace the HTML with whatever you wanted to use for your modal window. The Coldfusion syntax doesn't really need to change much. I actually meant is jqmodal using jqueryui dialog? No, it isn't built ontop of jquery ui. Good stuff. 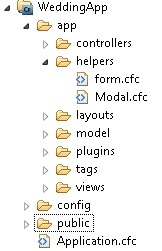 As for "I do believe you can override the built in functions if they are the same name and function name? ", you're correct. If you want to override any ColdMVC helper, just create a helper with the same name and the framework will use your helper instead of its own. I haven't tested the code yet, but looks good so far. Would it be possible to just generate a link and/or call the Modal from JS? I just ask because sometimes I would like an <a> and other times I want a <input type="button">. Looks like you could possibly pass it in through the "label" argument. Then I can do this for a modal that would show a quick view of a product stats. To know that modal should be rendered instead of regular link you would have to have $.modal.renderLink() automatically append a par that would be like "&renderModal=true". You just have to specify what the trigger is. Right now I have it set to a.modal_link and the ID that you pass in. That can be changed to whatever you wish. Also to determine whether you want a button or a text link you could specify an argument to determine what to render. I think I get what you are saying by separating the function into separate functions. Maybe we will have to talk later and come up with something.